(i) Normal/Regular taxpayers (including casual taxpayers) would have to file details of outward supplies (GSTR- 1), details of inward supplies (GSTR-2) and monthly Return (GSTR-3) for each registration State- wise. (ii) Normal/Regular taxpayers with multiple registrations (for business verticals or different business premises) within a State shall have to file GSTR-1, GSTR-2 and GSTR-3 for each of the registrations separately. (iii) Taxpayers under Composition levy shall file a quarterly return in GSTR-4. But ITC will not be available to such taxpayer. 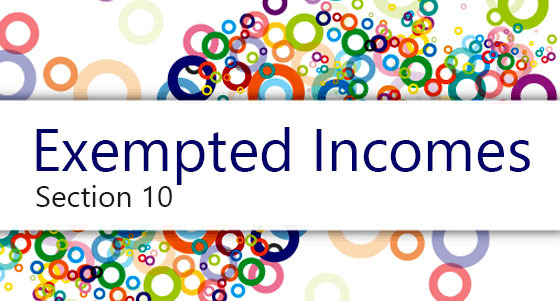 (iv) Taxpayers otherwise eligible for the composition levy can opt out of composition and file monthly returns and thereby make their supplies eligible for ITC in hands of the purchasers. In such cases, they will have to file GSTR 1 to 3 irrespective of their turnovers. (v) Casual taxpayers will have to file GSTR-l, GSTR-2 and GSTR-3 returns for the period for which they have obtained registration. The registration of Casual taxpayers will be done in the same manner as that of Normal/Regular taxpayers but with payment of advance tax. (vi) Non-Resident Taxpayers (foreigners) would be required to file GSTR-5 return for the period for which they have obtained registration within a period of seven days after the date of expiry of registration. In case registration period is for more than one month, monthly return(s) would be filed and thereafter return for remaining period would be filed within a period of seven days as stated earlier. 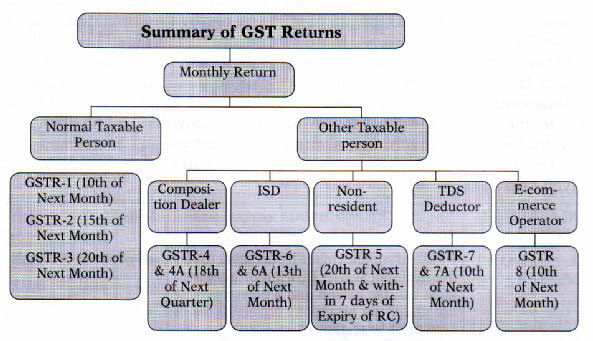 (vii) Annual return (GSTR-9) will be filed by all normal/regular and composition taxpayers. It will be based on their financial records. (viii) Cut-off date for filing of details of outward supplies (GSTR- 1), inward supplies (GSTR-2) and monthly return (GSTR-3) would be 10th, 15th and 20th day respectively of the succeeding month for all monthly returns. However, the facility of filing GSTR 1 will not be available during the creation and filing of GSTR 2A and 2 i.e. from 11th. to 15th. of the succeeding month. But changes made in GSTR-2 which shall be auto-populated under GSTR-1A of supplier can be accepted or rejected by the supplier upto 17th. of next month. (ix) Cut-off date for fifing of Quarterly return (GSTR-4) by the taxpayers under composition levy is 1 8th day of the first month of the succeeding quarter. (x) Cut-off date for filing of Input Service distributor return (GSTR-6) is 13th day of the succeeding month. 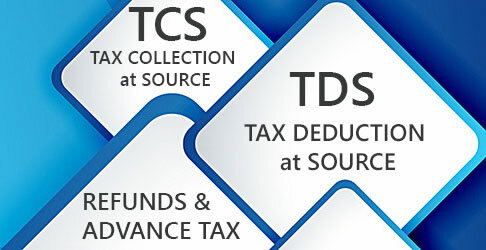 (xi) Cut-off date for filing of TDS (Tax Deducted at Source) return (GSTR7) by Tax Deductor is 10th day of the succeeding month. (xii) For Annual return, the cut-off date would be on or before 3Pt December following the end of the financial year for which it is filed. (xiii) Modification, addition etc. in the previous returns may be done only up to the fifing of Septembers’ Return of the next year or the Annual Return whichever is earlier. (xiv) The filing of return facility shall only be available through online mode. However, the facility of offline generation and preparation of returns has been provided. The returns prepared in offline mode would have to be uploaded before due date.